SERPed.net also comes with 'Link Indexer Pro', which is a tool that lets you send your links to 3 different link indexing services, including of course the most popular of all, Link Pipeline, but also Backlinks Indexer, and our proprietary link indexing service SERPed Indexer, which uses various online resources to help you get your links indexed. 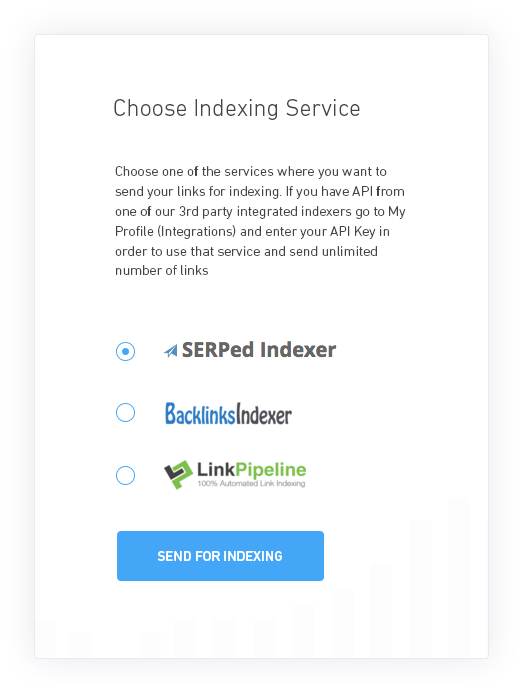 There is no way the search engines don't find and index your links after you have submitted them to 'Link Indexer Pro'... Doing this on your own with subscriptions to the best link indexing tools would cost you around $100 per month, so why not do it with SERPed.net? We don't suggest sending your niche sites, and rather letting new pages get found naturally, but often times you will build links that may never get indexed without some tiered work and some pinging. With this link indexing tool, you paste a list of links, click 'Send'... That's it. We handle the rest. There is a limit to how many you can send, but it's quite a high limit, however, if you want almost unlimited on any of the services you can connect it via the 'Integrations' section inside the members area.